Time to bite the bullet! I've recently had the time to get back in to Model Railways again, and as you are all so kind and willing to share your work here on the forum, it's only fair that I share some stuff aswell. I've been working on a couple of small projects but this one jumped the queue as it's been topical here on the forum. 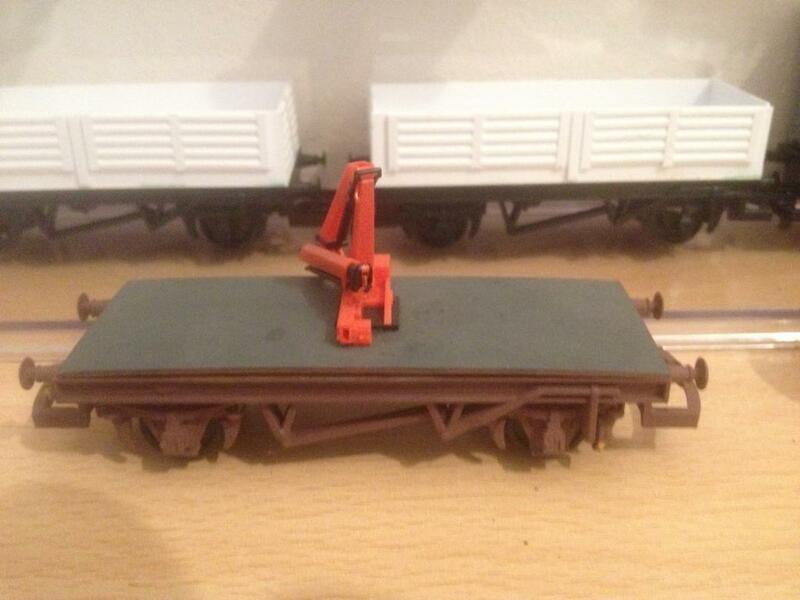 Thanks to Wexfordloco10 for sharing his images and answering Heirflicks original question about the Donelli Cranes. I've had a go at representing wagon #770 (which is how I remember seeing them) which is a 60' frame as opposed to the 42' #774 & #776 in the pictures. Painting and detailing to follow. 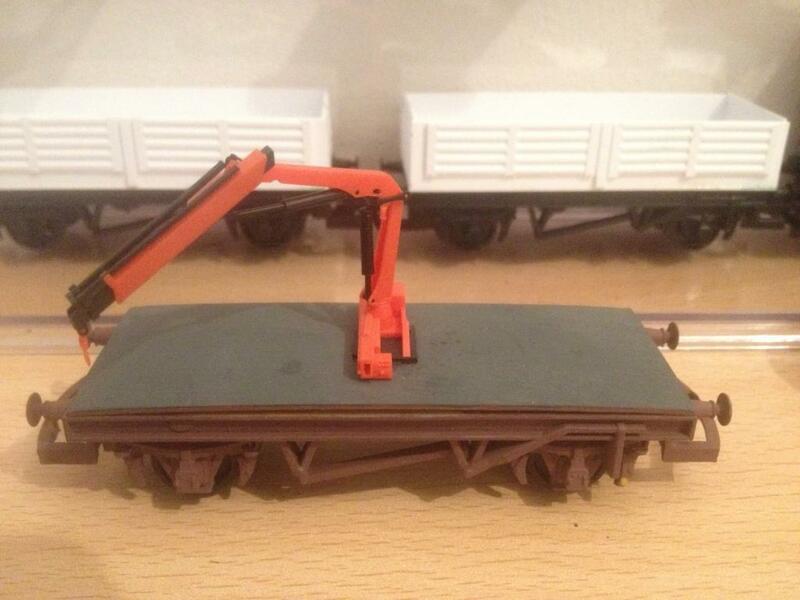 The second wagon carries the gantry arm that is suspended between the 2 cranes and lifts the track panels. 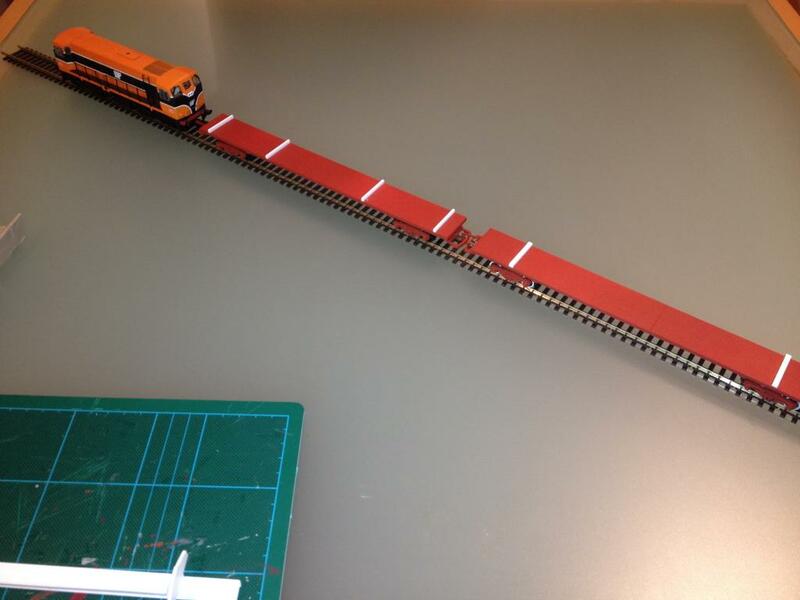 I will run this with 5 or 6 60' flats with track panels. Should look the part! 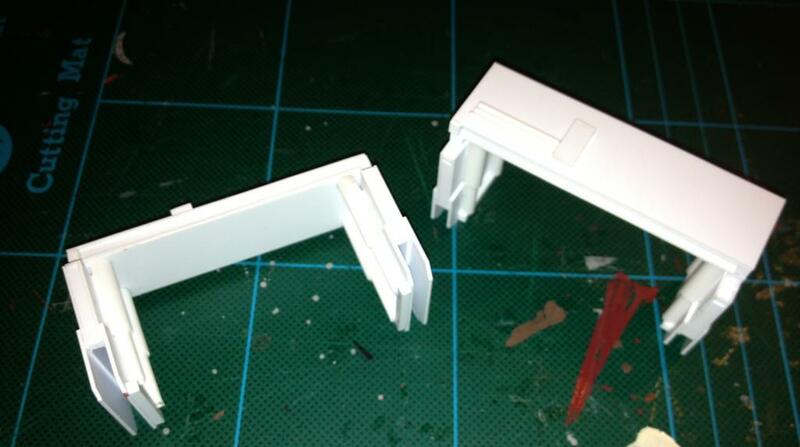 The crane bases are looking great Dave. Looking forward to seeing the finished product. Nice little project, looking good. A very innovative project and one I have not seen modelled before. Good luck on its progress. Nice work Dave, very nice. Nothing quite like seeing someone having a go at a most unusual train, and full length too. No half measures! How did you do the 60's and stopped them warping in the middle? i love it.... i cant get enough of p/way trains! well done! Holy God they are lovely,well done Dave. looks good so far keep the pic's comming,it will be nice to see the finished job. Like that idea! I miss the Orange and Black. I really do! It must be because every real train I saw as a lad was one! Congrats on this project you are doing - always very refreshing to see an unusual prototype! Well done Dave, I'm sure you know containers were also used for Beet Traffic. Thanks Kirley! They fairly piled in the beet on those wagons! New Project on the (New!) Workbench! Info required! So after a house move last year I've finally gotten round to carving out some space to set up a new, permanent workspace. And I've a couple of weeks off to get stuck in to some projects! 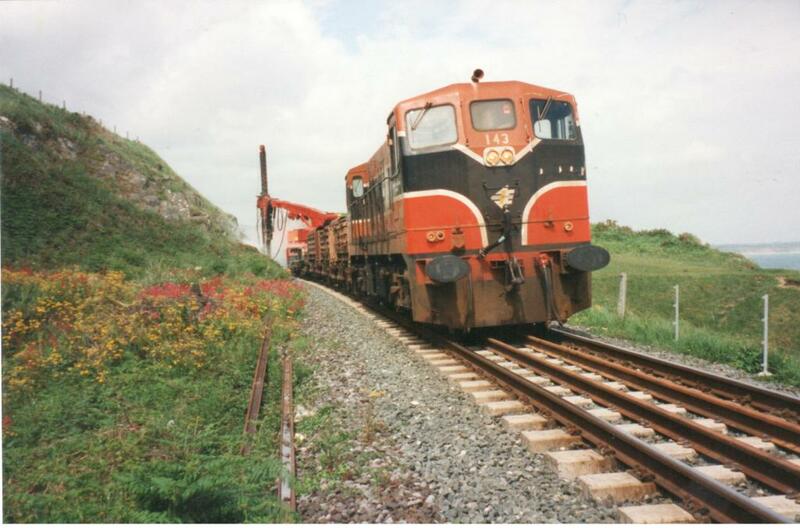 I'm a big fan of PW trains and a rare consist is the one that was used during the DART extension to Greystones. Loco 143 was assigned for the project and had a motley crew of 2-axle wagons and equipment. Someone on here referred to it as the ADtranz train, but I haven't found any reference to this online. Brian Flanigans picture on Flickr is the only reference I have, I never saw this train in the flesh. The consist was Loco 183, 3 old spoil wagons carrying drilling equipment, Wagon with Air Compressor, Wagon with Drilling rig, wagon with Drilling supplys (Red container), and some more 2-axles with spoil and CIE containers. Anyone can shed some light on this for me? How did you get all that from that grainy shot?!? Anyhoo, anything to do with dart electrification is really thin - perhaps the early eighties and trainspotting were the worst bedfellows. Trying to get some info on the overhead line maintenance (flat roof on a bredin) vehicle that was in vogue at the time is equally baffling. The engineers equipment makes an unusual model, I like the look of that drilling rig. The scrap containers were very heavily weathered to a browny black colourprobably a combination of road dirt and brake dust. It might be worth while looking through back issues of the IRRS Journal from that era for equipment used in the electrification. CIE was acutely short of coaches at the time, s mainly loose coupled corrugated opens and the odd 1/2 height container wagon used or spoil. Ready mixed concrete agitator on bogie wagon used to transport concrete to work site for signal and mast bases, short trains made up of 4w open and closed containers to transport tools and equipment, MK1 4w container flats fitted with Haib crane for erecting signal posts. I lost most of my very grainy photos from the electrification. Loose coupled train made up of unconverted beet wagons and 4w container flats with half height containers seem to used to carry spoil, most ended up dumped a Liffey Junction. Atlas "Rubber Duck" excavators widely used, CIE Priestman crane on Lomac hired in Ruston or NCK crawler cranes for lifing in point and crossing work, baby Metrovicks n engineers trains. John, great info and a superb pic! - RICHIE...did you see this? are you willing to have a go?! - i will as always give it a good home! 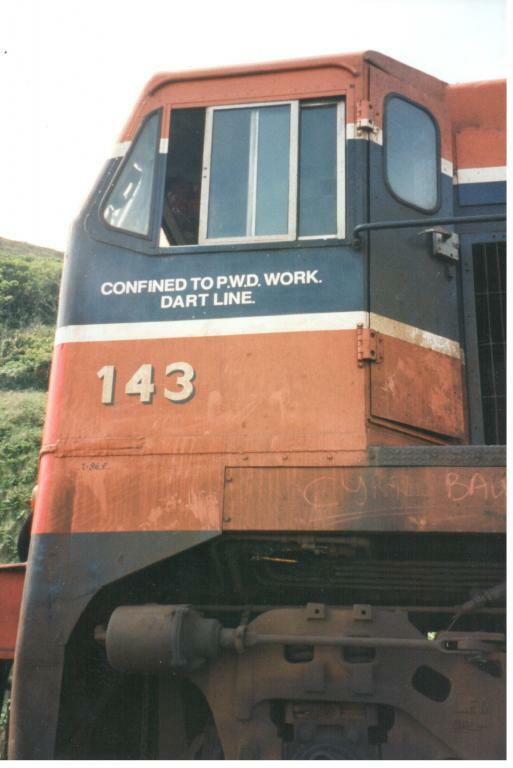 Note the wording on 143 'Confined to PWD work, Dart line'. Part of the draw of this model is that it is so rare and unique! I think that 143 was involved in a crash, thus got stuck with this duty for its last days! 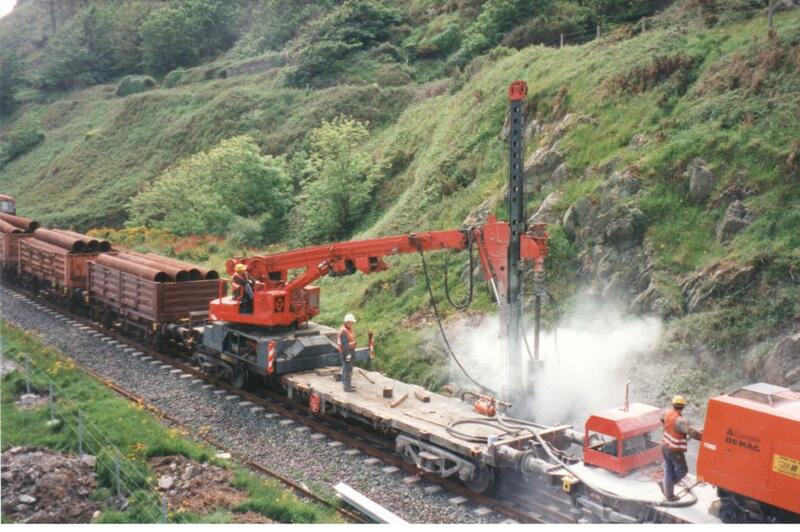 The drill rig was required because of the difficult terrain around Bray head. 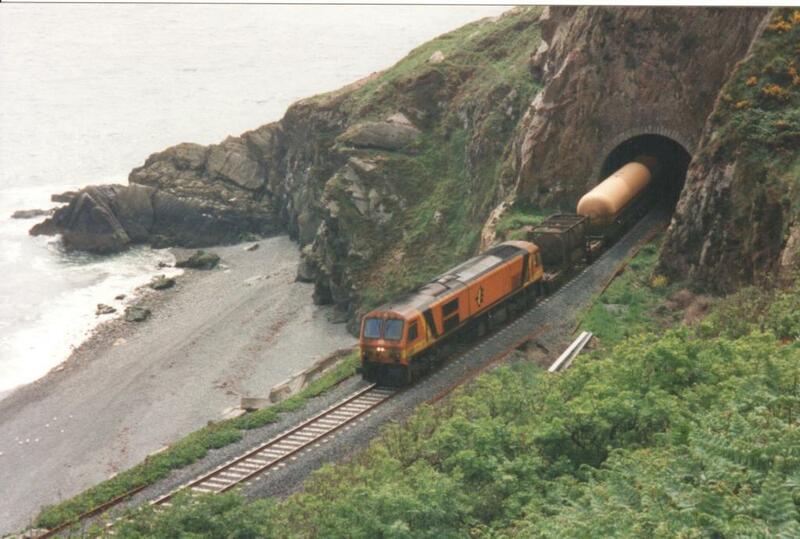 Remember that the DART was only brought to Malahide at this time too! Heirflick- for once I'm one up on you! It wouldn't be up to Glendergs standards but this sits in a siding at the back of a shed on my layout, and it's my intention as John rightly points out, to weather all of the bits of stock I've made up over the years! Finally, back to the original question! 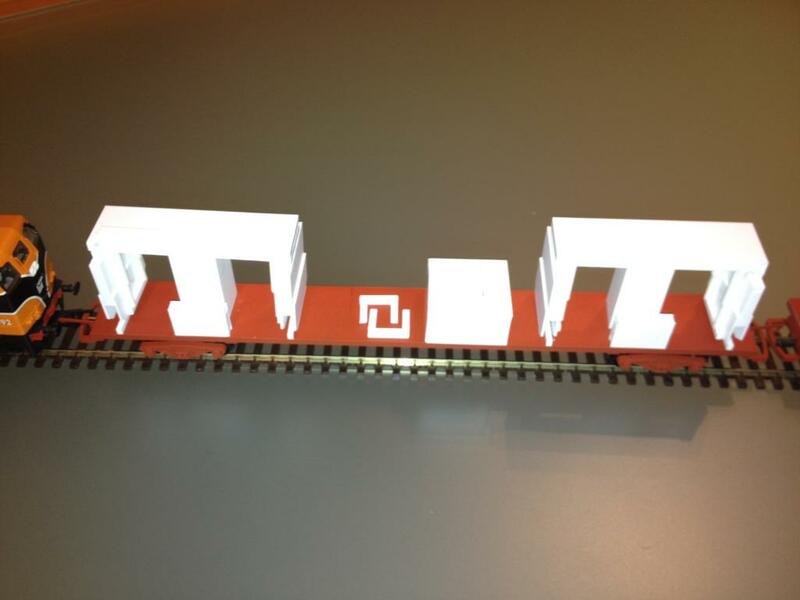 Would that then make it possible for lowmacs or bogie flats to be in use? For the time being I'm planning to put the drill rig and compressor on 2 lowmacs, and leave the rest on 2-axle wagons. Updates to follow! Sure did see it Shem, and looking forward to the dirty results. Current per way fetish is the Cable train shem.... but if I can get any more photos on the electrification, why not?! Well done Dave, it looks smashing so far. is that the consist on the left? As for the Donellis... I realized I was working off a very old design where the Donellis were mounted on a 60' wagon, which puts the model way back into the early 80's, 10 years befor my modeling time! 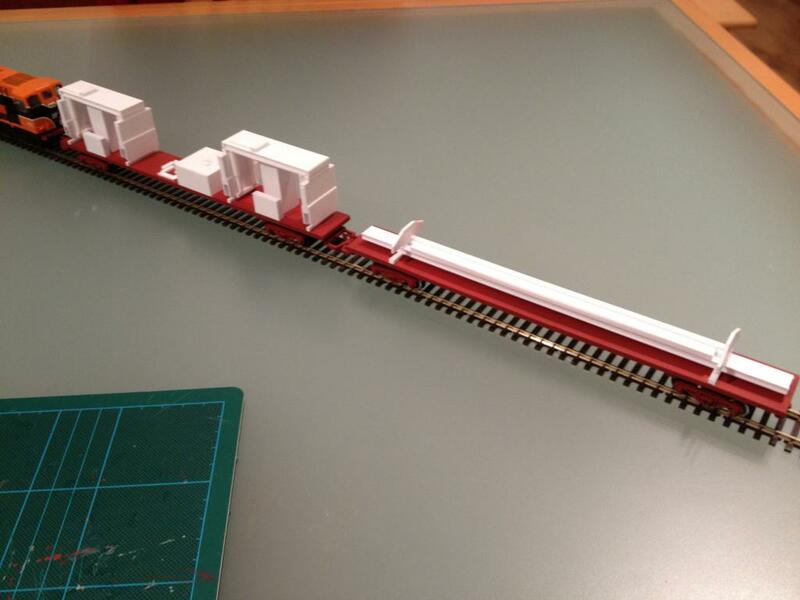 Since I started some really good images have appeared up on this site so I've parked that project for a bit, until I get a suitable 42' chassis. I guess that's it's predecessor. That would be 20 years before my version! That shot is from '82 or '83 when the Electrification first began. You have reminded me of a memory as a 6 or 7 year old staying down at my Granny's house in Eastwall, when there used to be a signal cabin up on the embankment out of Dublin Port on to the Belfast line. I remember that all being dismantled and the overhead lines being installed in a very short period of time! 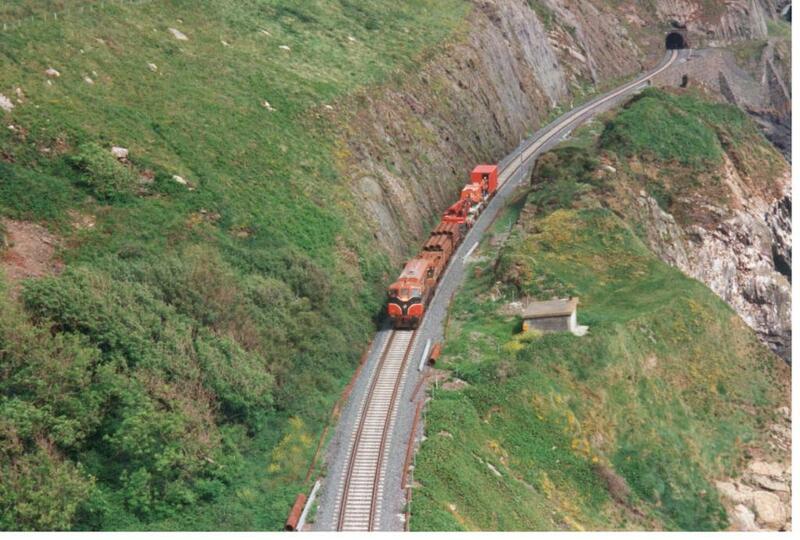 Dave, here are some photos of the train working on Bray Head, close to where the cliff path crosses the line just above Naylor's Cove. 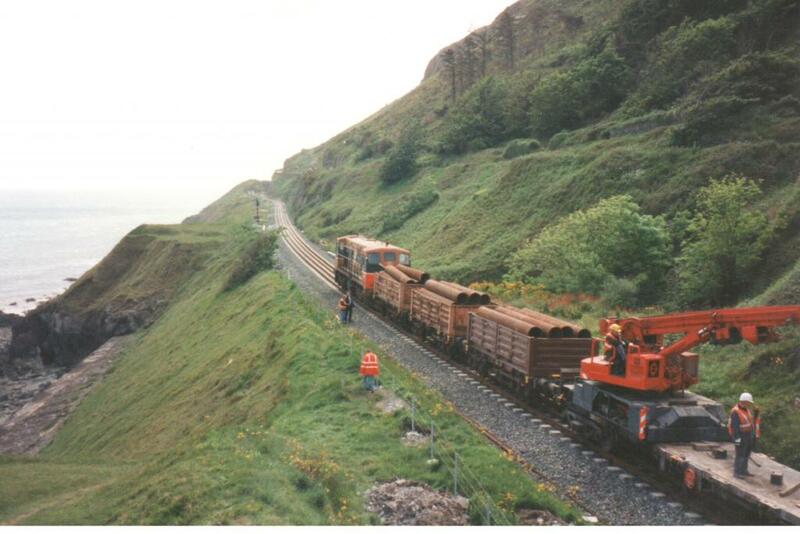 The train consists of Loco 143 at the Greystones end, three 4-wheel wagons with half-height containers carrying steel tubes, a bogie wagon with the pile driver, a 4-wheel wagon with an air compressor and a bogie wagon with stores container and work area. 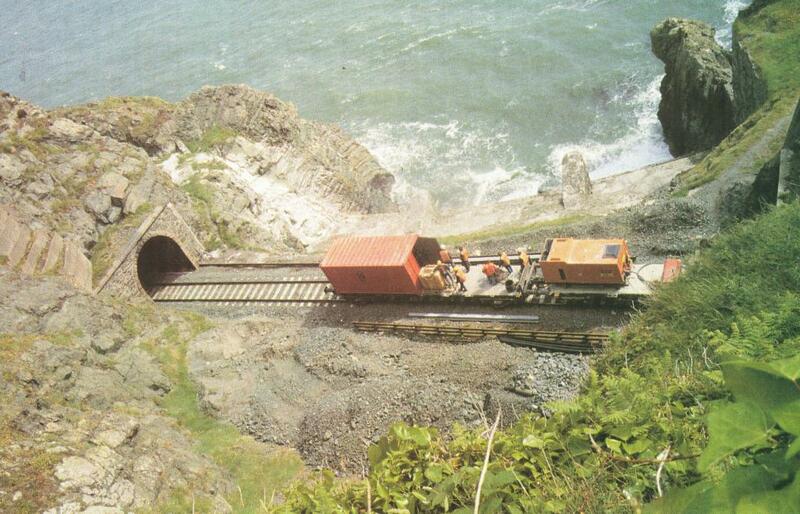 The train propelled from Greystones to the work site, returning loco first after work was completed. 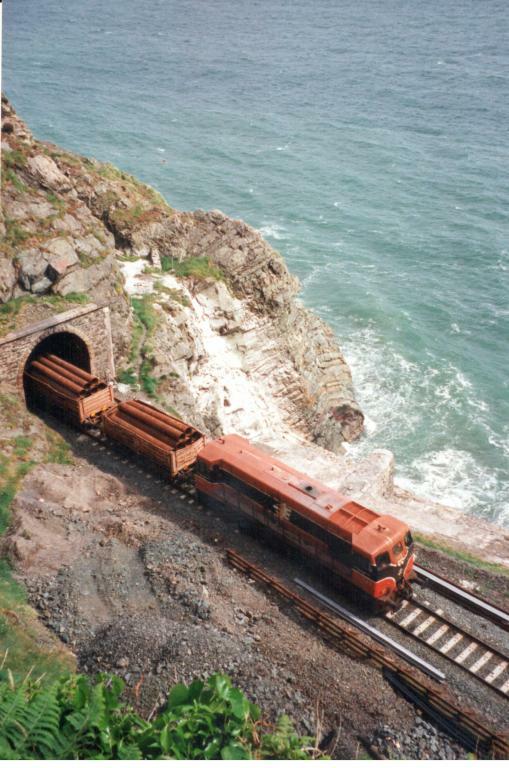 The works train propelling backwards from Greystones is approaching No. 1 Tunnel. Note the steel tubes and OHLE masts laid out alongside the track. To the right of the current tunnel is Brunel's original 1855 Brabazon tunnel, abandoned in 1876. The rear wagon on the train, which is in the short open air section between No. 1 Tunnel (on the right) and OBR147A, carried a 20' container containing equipment for the drilling rig, and also had a work area. Behind the train are two of the footings for one of Brunel's wooden viaducts. The loco, 143, and two of the wagons with half height containers entering OBR147A. The train has arrived at the work site and the pile driver is being deployed. A view from the Greystones end of the train with pile driving in progress. 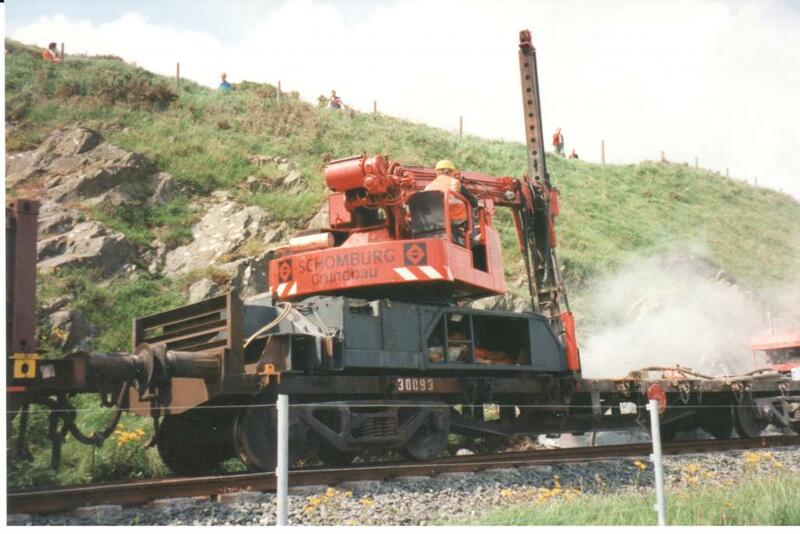 Close up view of the Schomburg Grundbau pile driver mounted on 42' 9" bogie flat wagon 30093. This was one of eight wagons (30091-8) fitted with floors for transporting steel traffic. Pile driving work in progress. 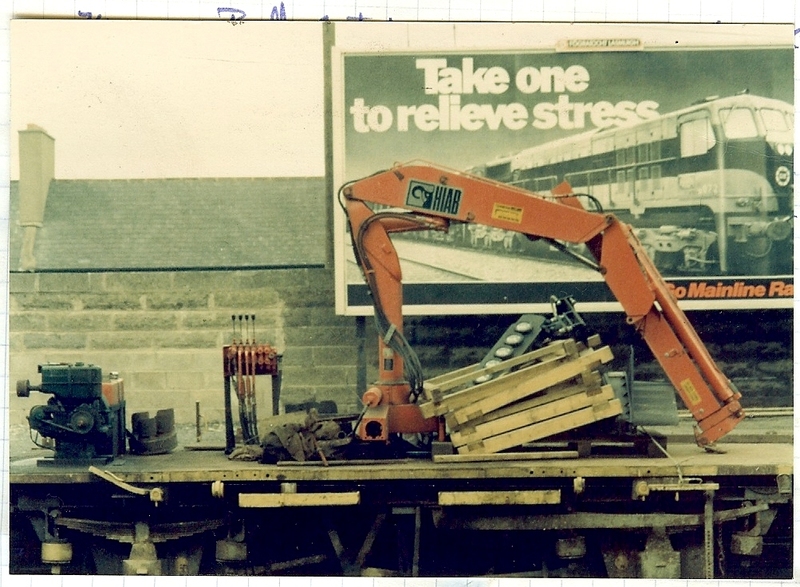 The HIAB crane in Mayner's earlier post (#20) was used by the S&E Department for erecting signals and for off loading / recovering other equipment, e.g. location cases. that is fantastic stuff -great pics and info! 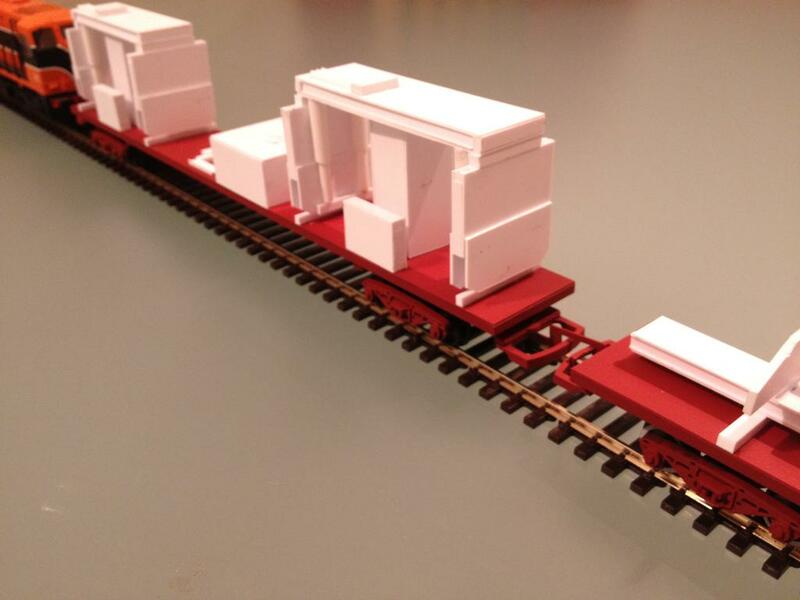 that would make for a great model of p/w train for any layout!! Fantastic Josefstadt!!! That gives me all I need! I'm gonna have to modify my drill rig a bit, but otherwise I'm going the right direction. Brilliant images! Thank you so much for taking the time to post that up for me. No problem Dave. Happy to oblige. The pics were taken sometime around the June Public Holiday in 1998. Work on erecting the masts was undertaken between early May and mid-July of that year. as a matter of interest lads - was all trains stopped on that line for the duration of the works, or was a few trains let by during the day? For suburban services I think that peak services operated but off peak ones were probably cancelled. Again, compared to now, there wouldn't have been a great number of services. thanks for that J, and thats a smashing pic of a dirty big girl!!! have you any more jems like that? Ditto on heirflick's request! What a stunning capture!! ... thats a smashing pic of a dirty big girl!!! have you any more jems like that? Careful HF. If HID* reads that she'll might get the wrong idea! She'll think I'm like those spivs of old "Pssst, want to buy dirty postcards"!! I'll see what I can turn up. I'm slowly scanning some of my collection of prints and slides taken over the years.